Each Aqua Biofilter™ project design and installation is based on client and stakeholder needs, project requirements according to relavent regulations, and key water quality data that guides the project approach. Aqua Biofilter™ modules are constructed ruggedly, made of long lasting materials, built to last, in any conditions. 4) Site characteristics such as local and regional ecology, aquatic biology, water depth and variation, rainfall and storm events, atmospheric variation, exposure to wind and other site influences, etc. 5) Birdlife and aquatic animals. 6) Habitat and other values. Installation costs are variable according to the above factors. Previous installations have ranged according to project, site, client and stakeholder requirements. and in different countries. Please contact Tom Duncan info@aquabiofilter.com for further information. Aqua Biofilter™ Bega Urban Stormwater Wetlands Trial, Carex after 14 months growth, 2.2 metres in length, at planting only 30cm length. World first marine specie saltmarsh floating islands for migratory water bird habitat. Tidal estuary height differential of 1m. Installed 2 islands at 60m2, total of 120m2 June 2012. Black swiftlets, black swans and migratory birds will use the floating islands for habitat. June 2011 520m installed in two stormwater and sediment ponds. No algal or azolla bloom compared to previous years, good results. Results indicate strong root and shoot growth of Carex, doubling in size over 3 months, from 30cm at plant out to 2.2 metres length in 14 months. 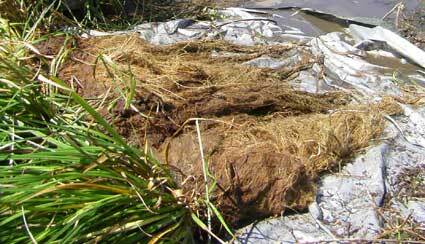 Bolboschoenus & Vetiver excellent performers with root growth down to 50cm in just 3 months. Wastewater column high nutrient loads, large volume of salts uptake. Aqua Biofilter™ plants developed early with root and shoot growth, effectively reduced nutrient levels to prevent algal blooms. 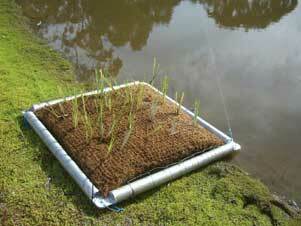 Aqua Biofilter™ trial to extract salt with a Halophyte forage crop, indicates brackish water can be treated. Copyright 2004 - 2014 Tom Duncan. All rights reserved.